Accrued liabilities are a little-known but important part of your business financial position. These liabilities can sneak up on you so you need to pay attention to them. Liabilities are continuing amounts your business owes to others. A liability might be a loan or a mortgage on a business building. A liability might be short term or long term. For example, the part of a loan that is due within a year is short term, but the rest of the long is long term. 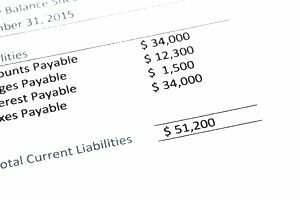 In accounting, the most common liabilities are accounts payable. These are amounts that you owe for purchases that have not yet been paid. For example, if you buy office supplies from an office supply store and you charge those supplies to your account at that store, you are creating an account payable for that amount. When something is accrued it means it accumulates. In accounting terms, if a liability is accrued it means that the liability must be paid at some future date. So accrued liabilities accumulate over time and they are paid at specific times. A simple non-accounting example of an accrual is that an employee can accrue (accumulate) sick time each month. Accrued liabilities work the same way as accrual accounting, in which income and expenses are recognized on business financial statements at the time the transaction is final, not when the cash changes hands. Two common types of accrued liabilities are sales taxes payable and payroll taxes payable. They accrue because the amounts accumulate over time, then they are paid. These payables are created from specific transactions, when sales tax is collected and when payroll taxes are withheld or deducted from employee pay. Payroll tax payables are also created from your business' responsibilities to pay FICA taxes (Social Security and Medicare taxes) and other employment taxes. Sales Taxes Payable: When your business sells a taxable item or service, you must collect the sales tax, then you must report the amounts collected and make payments to your state's tax department periodically. If you use an online accounting program or an accountant, each sales tax amount is put into the Sales Tax Payable account until you pay it. Step A: You collect $13.40 from a customer for sales tax on an item you sold. Step B: Since you haven't paid this amount, your accounting software records this $13.40 as an accrued liability—Sales Taxes Payable. Step C: When you pay this amount to your state taxing agency, it is taken off the Sales Taxes Payable account on your balance sheet. Accept the liability for federal and state unemployment taxes. The process described for sales taxes works the same for each of these payroll tax payable accounts. When the payroll is run, the liabilities are entered into the payable accounts. When the payments are made, the amounts are removed from the payable accounts. Sales taxes payable and payroll taxes payable are called trust fund taxes ​because the amounts are held in trust for payment to federal and state taxing agencies. These amounts should be held in a separate account or kept separate in other ways so you won't be tempted to use them. The IRS and state taxing agencies impose trust fund penalties on businesses that don't pay these taxes. In the case of the IRS, these trust fund recovery penalties can be imposed on the individual who is responsible for the payment of these taxes and who "willfully fails to collect or pay them." The responsible person can be held personally liable. Your business balance sheet records your business assets on one side and liabilities and owner's equity on the other. The accrued liabilities are included on the right side of the balance sheet. Short term accrued liabilities (those expected to be paid in less than a year) are shown before long-term liabilities.